Friday, Halloween- A busy day for the girls. The Flu Vaccines we have been waiting to come in, arrived. Off to the doctor we went. Emily had to be checked over real good before hand. I've suspected an ear infection or something, but nope. Healthy as can be, just a little teething pain. (She has 6 teeth as of 10 Months!) She was weighed too. Yep, Princess Emmy weighed in at 22 pounds and 6.5 ounces. Amazing! She gained about 3 pounds in 3 months. She received the flu shot. Izabel received the Mist vaccine in an attempt to keep shots out of the system until age 3. Since fracturing her leg this past summer, Izabel does not do very well in a doctor/hospital environment. We rushed back home to make our 4pm Trick-or-Treating event downtown on main street. The girls had a great time and went from store to store asking for candy. 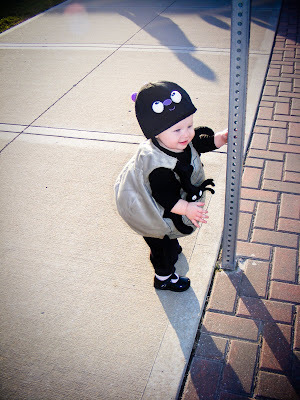 Emily was the cutest spider there was and the only spider we saw. Things were going well until we left. Buckled into her seat and on our way home, Izabel starting throwing up and crying. Hmm, not a good sign. She continued to throw up this radioactive looking yellow goop until about 7:15 that night, When she finally said she NEEDED to go trick-or -treating with Gama and Papa. I think the Flu Mist caused the vomiting and tummy ache. I will be calling the Doc first thing tmrw morning to see if we will need to redo the vaccine in the shot form. Izabel and Emily trick-or-treated until almost 9pm Friday night and had more loot than I know what to do with. Everything from healthy crackers to the darkest of chocolate. It was a very good evening. Saturday, Parties- Saturday afternoon we went to a surprise birthday for a family member turning 85 years old. It was wonderful to have everyone together, including all the baby cousins. Wouldn't you know I forgot to charge the camera batteries, so no photos of such a special event. After the surprise birthday party, we headed over to the Bryant's for some good food, great drinks and Guitar Hero. All of the kids played together very nicely and big sis Hunter spent a good amount of time occupying the kiddos. Tucker is growing up so fast. It seems like just yesterday he was born but he is well on his way to his fourth birthday! Greg and I got to play Guitar Hero for the first time last night as well. So much fun! I think I could become addicted very easily! Greg plays guitar so doing it in a game was pretty easy for him but me, yeah, I need a lot of practice. Todd on the other hand had a lot of practice and showed off some pretty good guitar playing skills. Thanks so much Kare and Todd for having us over. We had a blast and look forward to doing it again soon. Today has been pretty quiet. I am exhausted and look forward to taking a quiet bath after the girls go to sleep...early. Tmrw my first giveaway will begin! Be sure and check back to enter! Beautiful photos, and that spider, he sure is a cute little guy. Glad to hear you guys had a great Halloween. Oh, for crying out loud -- that "Sharon" comment was me. I keep commenting under my wife's account. Have I done this to you before? Well, aside from the vomiting and crying, it sounds like a great weekend! :) Hope everyone is well now. The pics are, of course, adorable!! Oh and nice header... very festive for the upcoming days!! Happy Sunday!! oh...and love your new design! What a fun Halloween for your family! Loved the costumes! Oh my - what a busy weekend!! 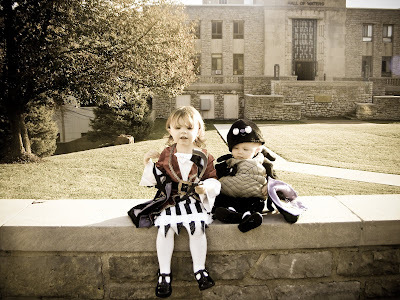 The kids are TOO cute - I love those costumes! love your new header - BUSY weekend!! Those are the cutest little costumes ever!!!!! I love your girls! What a couple of cuties!! It sounds like your weekend was crazy busy, but fun. You have a blog award waiting for you here . . . They look so cute in their costumes! Glad they had a fun time :). 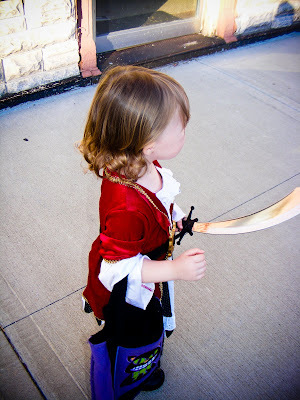 Oh my gosh, those are cute costumes!